What is Liquid Zeolite ? We are the WORLD'S LEADING Manufacturer and Supplier of Liquid Zeolite Products: Liquid Zeolite Enhanced with DHQ! Selling Liquid Zeolite worldwide for nearly 19 years! Liquid Zeolite Enhanced with DHQ is a dietary supplement preferred by many cancer patients, cancer survivors as well as healthy children and adults. Liquid Zeolite Enhanced with DHQ is recommended and sold by more physicians and healthcare practitioners than all other brands of liquid zeolite & zeolite powder combined. Don't waste your money on inferior copy-cat formulas, even ones that claims to be more potent yet lack all it's essential ingredients! Liquid Zeolite is the brandname product. It is the brand of zeolite liquid recommended and sold by more healthcare practitioners than all other brands combined. Real, Genuine Liquid Zeolite is manufactured ONLY by Liquid Zeolite Co. Inc. and is ONLY sold in a blue-white-silver labelled bottle. Don't be confused by the fake, copycat, imitation brands sold under various names. Even one company is selling a fake, copycat version with a maroon label or brown label and using the name Liquid Zeolite on it. 100% Natural Ingredients: Proprietary Blend of 100% Pure NATURAL Volcanic Zeolite (clinoptilolite), Humic Acid, Fulvic Acid, Dihydroquercetin (DHQ), 72 Naturally-Occurring Angstrom-Sized Trace Minerals, PhytoNutrients, MacroNutrients, MicroNutrients, "M-Water", Citric Acid and Potassium Sorbate to maintain freshness. Each batch is also gently-pasteurized and lab tested by a 3rd party independant lab to assure a 100% safe and effective product. 100% Pure Clinoptilolite: Liquid Zeolite is composed of the zeolite subgroup called "clinoptilolite" the type of zeolite that has generated such amazing results in laboratory testing. Liquid Zeolite is much more effective than zeolite powder. It is chemical free: Liquid Zeolite is processed without chemicals. Through a natural, proprietary process, concentrated organic humic acid molecules naturally hold zeolite in permanent suspension. The natural zeolite powder used in Liquid Zeolite is ultra-micronized & it's zeolite cages are thoroughly cleansed. There is no substitute for organic humic acid/fulvic acid to revitalize your cells and reverse cellular degeneration. What makes natural Liquid Zeolite better than other major brands of liquid zeolite? Many other brands use chemicals, solvents and/or high-heat treatment methods to process their zeolite into a liquid form. Natural Liquid Zeolite utilizes the newest most advanced proprietary natural holistic manufacturing process of using natural organic supplement-grade humic minerals (a highly regarded organic medium) which enables the zeolite to penetrate cells rapidly. Dihydroquercetin (DHQ), also called taxifolin, is a bio-flavonoid similar in structure to that of quercetin. Nearly 600 studies conducted over the last 50 years have investigated its safety and effectiveness. Flavonoids perform 2 important functions: they strengthen your body’s immune response and they act as powerful super antioxidants. Flavonoids are polyphenolic compounds that are ubiquitous in nature and are categorized, according to chemical structure, into flavonols, flavones, flavanones, isoflavones, catechins, anthocyanidins and chalcones. Over 4,000 flavonoids have been identified, many of which occur in fruits, vegetables and beverages (tea, coffee, beer, wine and fruit drinks). The flavonoids have aroused considerable interest recently because of their potential beneficial effects on human health-they have been reported to have antiviral, anti-allergic, antiplatelet, anti-inflammatory, antitumor and antioxidant activities. Flavonoids may help provide protection against these diseases by contributing, along with antioxidant vitamins and enzymes, to the total antioxidant defense system of the human body. Epidemiological studies have shown that flavonoid intake is inversely related to mortality from coronary heart disease and to the incidence of heart attacks. Antioxidants are compounds that protect cells against the damaging effects of reactive oxygen species, such as singlet oxygen, superoxide, peroxyl radicals, hydroxyl radicals and peroxynitrite. An imbalance between antioxidants and reactive oxygen species results in oxidative stress, leading to cellular damage. Oxidative stress has been linked to cancer, aging, atherosclerosis, ischemic injury, inflammation and neurodegenerative diseases (Parkinson's and Alzheimer's). Liquid Zeolite is the BEST method to deliver zeolite to the cells. A proprietary, organically induced, advanced technology is used to absorb the natural cellular zeolite directly into the molecular structure of the humic mineral complex. The zeolite mineral molecule is mixed with a humic/fulvic mineral complex, producing a highly stable and suspended potent bioavailable cell-penetrating trace mineral supplement. Combining natural cellular zeolite with humic/fulvic minerals, delivers a powerful natural heavy metal removing, pH balancing, immune supporting and remineralizing trace mineral dietary supplement. What makes Zeolite so unique is its negatively charged, crystalline cage-like, honeycombed structure. When ingested, this natural mineral attracts and irreversibly binds toxic heavy metals, chemical elements, and free radicals and is then excreted through the urinary tract. One of the most significant benefits of Zeolite over other heavy metal removing agents is its affinity schedule for toxic heavy metals. Zeolite binds with mercury first and lead second, moving on to additional positively-charged toxic heavy metals and chemical toxins which may include pesticides, herbicides, plastics, without removing vital nutrients such as calcium and magnesium. However, Zeolite goes far beyond the critical job of removing damaging toxins. Research has shown that Zeolite also removes free radicals. 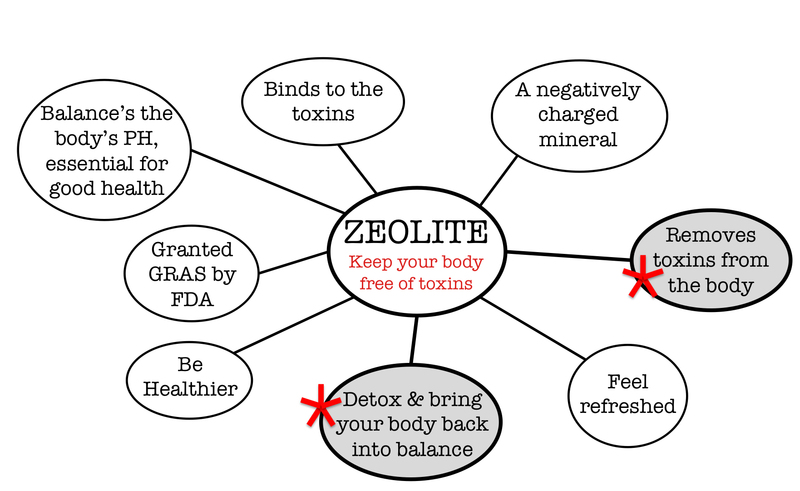 Unlike classic antioxidants, Zeolite does not neutralize free radicals by donating an electron to stabilize them. Instead, its structure captures free radicals. Once trapped inside the cage, the inactivated free radical can then safely be eliminated from the body. • Zeolite has broad-spectrum antiviral properties: first, by attracting and binding viral sub-particles, thereby interfering with viral replication and eliminating them from the body and second, by inhibiting viral proliferation via immune modulation of T cells. • Zeolite helps maintain proper pH by removing acidic ions and chemicals which then promotes optimal metabolic and immune functions. • Zeolite may help to eliminate carcinogenic toxins from the body, especially a category of carcinogens called nitrosamines. The most common sources for these nitrates include processed meats, cigarettes, and beer which are linked to pancreatic, stomach, and colon cancers. • Zeolite promotes healthy digestion and encourages nutrient absorption. Clinoptilolite Zeolite’s ability to capture ammonium ions during digestion promotes a healthier and less toxic digestive system. Referred to as the “missing link” to optimum health and nutrition by leading scientists throughout the world, humic acid is a healthy way to improve your health. Medical studies now show that it has the ability to significantly change our life for the better. It is so safe, powerful and effective that it has been used around the world for hundreds of years with amazing results. Human dietary supplementation with humic acid is bringing about life changing results for so many people worldwide! So what exactly is this miraculous substance? Humic minerals are the smallest, most complex, most highly refined naturally occurring water-soluble substance on Earth. Tiny amounts remarkably transform the molecular structure of water, making it intensely more active and penetrating. Humic acid then assists water in its job of dissolving and transporting. It helps carry nutrients into the cell and waste products away from the cell, while also helping to neutralize toxins and invaders. Humic/fulvic mineral complex is one of the smallest, most complex, most highly-refined naturally occurring water-soluble substance on earth. It is an all-natural substance that has been extracted from ancient deposits of organic matter. It has been sterilized and refined for human use as a dietary supplement. Tiny amounts remarkably transform the molecular structure of water, making it intensively more active and penetrating. Humic acid mineral complex then assists water in its job of dissolving and transporting. Click the button below to add the Zeolite Liquid Enhanced with DHQ 1oz/30 ml - 9 for $112 Only $12.50 ea. ($10 Flat Rate Shipping) to your wish list.